Haida Gwaii Renewable Energy Symposium Summary now available! Did you miss the Renewable Energy Symposium last fall and want to know what happened? Did you attend and want to reflect back and read about the event? Swiilawiid is proud to present the Renewable Energy Symposium summary, including overviews of the presentations, Hlk’yak’ii, To Start a Fire printed in full, and many more words of wisdom shared at the gathering. Pick up your copy at public spaces around the Islands today or view & download the full PDF here. September 29-30, 2018 were historic days in Gaw. Over 100 Haida Gwaiians gathered at the Old Massett hall to connect, learn, and share information on our electrical systems today. Together, we started to carve out what our clean energy future will look like. Local governments have all endorsed this Clean Energy Declaration, and Island citizens signed this pledge committing to energy sovereignty by 2023. CLICK HERE TO SIGN THE DECLARATION! Swiilawiid Sustainability Society is a place-based not-for-profit doing research and communications on Haida Gwaii. We work to inspire local residents to take meaningful action and reduce our collective carbon footprint. 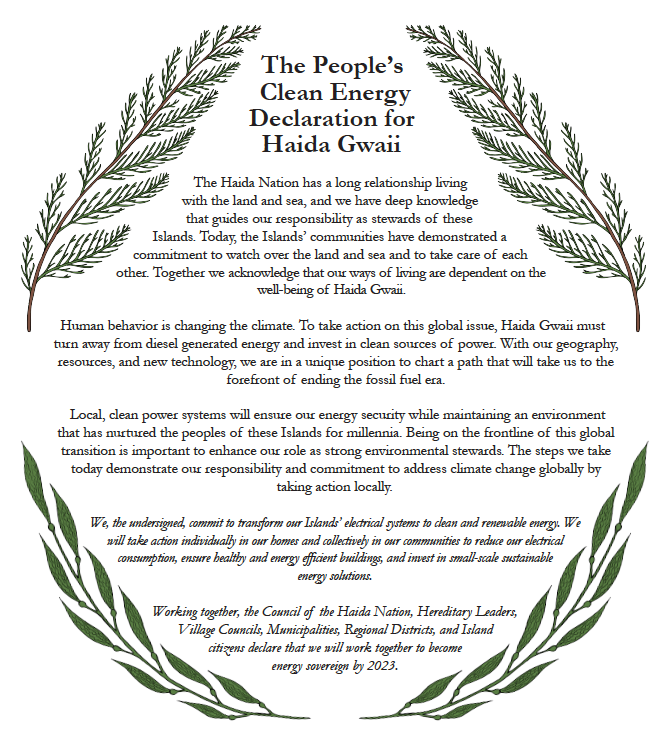 Project 0% Diesel is our sole focus at this time, and the name says it all: We want to see Haida Gwaii lead in the transition to clean, community-owned power. Renewable energy is key to both maintaining the Islands’ reputation as strong environmental stewards and taking meaningful action on climate change. As local residents, we are proud stewards of the land and sea and we’re committed to working with our friends and neighbours to reduce our carbon footprint. Like our work? Join the Shift and consider making a secure donation online.